CSF exists as a group of students who believe that God is revealed to humanity ultimately in Jesus Christ who is fully God and fully human. We seek to know Jesus Christ as savior, teacher and lord and to make known the love of Christ to others. We believe the teaching of Jesus is summed up in the command to love God and to love your neighbor, so we desire to promote love of God and love of each other on campus. Mission: to love God and love others. 3. Promoting service and activities on campus, in the local community and through the entire world. 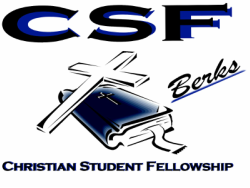 Membership Statement (From our Constitution, Submitted to Penn State Berks Student Government Association):Membership in CSF shall be open to those who wish to be part of a community focused on Jesus Christ. Our weekly meetings are very informal and any person is welcome. All opinions are valued and respected. As a Christian organization, we adhere to historic Christian orthodoxy as laid down most clearly in the early church ecumenical councils. Thus, we favor no branch of Christianity but instead seek unity on what Christians from diverse backgrounds agree on. We believe each human being is created in God’s image and thus has value, so we do not discriminate against any gender, race, ethnicity, religion, physical handicap, socioeconomic status or sexual orientation. Along with that, we believe each human being is broken (sinful) and in need of God's grace and love.